Amazon achieved what many qualified as mere promotion; make a delivery of a package by using a drone. And it does through its Amazon Prime Air service that allows deliveries of packages with a maximum weight of 2.6 kilos at a maximum distance of 25 kilometers. The first package contained an Amazon Fire TV Stick (a video player which is connects to the TV) and a bag of popcorn. Very appropriate combination. While it is true that the Amazon project will not be viable in most cities, it is a step. They face legal restrictions that prevent this type of aircraft flying over populated areas, or afford require a pilot with constant visibility with the drone. 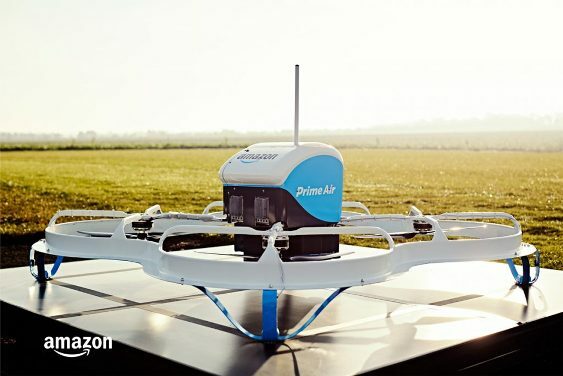 Amazon Prime Air is designed for rural areas, where small distribution centers will have several drones delivering packages to customers with Prime subscription. This first delivery is controlled and, yes, it is a part of its campaign of marketing. A client that has a large green area where the drone can land, a distribution center which in reality is the testing area of Amazon that can send packets, a pair of products that exemplify the kind of orders that can be done… A system of very limited delivery, but no doubt people will find utility. That this delivery takes place in England is not a coincidence. Amazon has a research center in Cambridge, with a secret test area in the middle of the English countryside. Nor should we forget that this country is the only one that has given legal facilities to do their tests. How will this delivery model work in cities? The answer requires that many parts be understood, from municipalities that allow flying these apparatuses in populated areas, to architects who provide a delivery zone in the roofs of the buildings. But hurriedly, the problem would not be legal problems, but how to set the priorities of those shipments avoid having thousands of drones flying over our heads.